Lovelies, did you realize Mother's Day is fast approaching? Yikes, neither did I! This year I have a lot to thank my mother for (besides you know, life)...she's helping with everything for the wedding, and she deserves a big thank you! 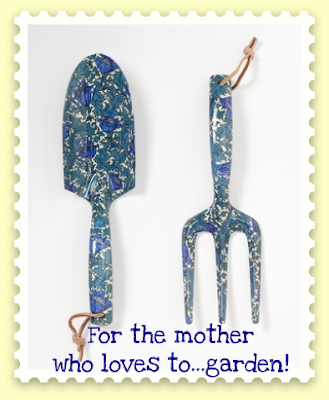 She's not one to garden, but if she were, I would love to get her this great gardening set from Coldwater Creek. This Anemone Garden Tool Set is not only perfect for carrying around the yard because it's lightweight, but it's gorgeous, too! It's designed after patterns from the Victoria and Albert Museum in London; I love the idea of beautiful garden tools. She would be so proud to show these off to the neighbors. Pair these with some seed packets and a straw hat, and you're good to go for Mother's Day gifts!